Survivalist Seder: This Passover, we packed go bags. 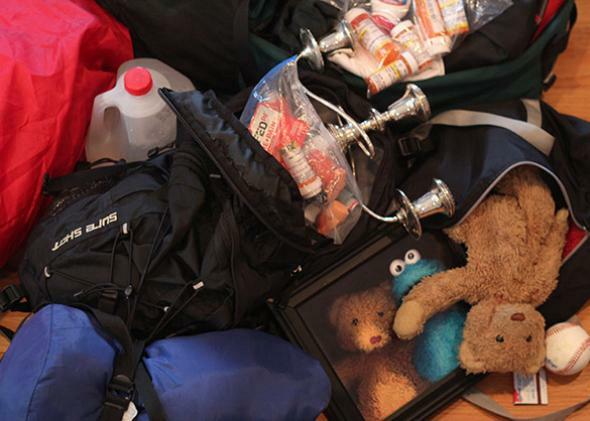 This Passover, we packed emergency preparedness bags, in case we had to run. The kids packed a lot of photos and stuffed animals—and photos of their stuffed animals. Aaron had been thinking for a while now that for Passover, which comes with its own stash of basement boxes—foods and dishes to be used only for eight days a year—we’re all forced to create what he calls “a mini household in a closet.” And the Passover story, at least as he thinks about it, is really all about leaving home quickly in an emergency, with only the stuff you can carry. So Aaron sent out an email to our Seder guests simply asking “for everyone (kids included) to take some time this week packing a ‘bag’ of your necessities if you had to pack up and leave your home as our ancestors did. The only requirement is that it should be something that you could reasonably carry without having to ask someone else to do it for you.” It was our first ever Emergency Preparedness Seder. We will probably do it again next year (if we make it to next year). A few thoughts about all this: Our sons really weren’t into it. As the week of Passover approached and we hounded them about cleaning their rooms, stowing their lunchboxes, and “packing their bag for the Seder,” they both balked at the task, calling it depressing and morbid to think about having to pack everything you value in a backpack to bring to the Seder. As the days passed, they kept refusing to do it, even when we gently reminded them that people all over the world, throughout history, including their ancestors, have had to pack up a bag and flee and that we were doing it just because it was interesting, not because we had to. Right before the Seder, Aaron disappeared to pack, thus missing the arrival of the first guests and the ritual fussing with the brisket and obligatory throwing of noisy rubber frogs and fake boils. When he emerged, he did so with an astonishing assemblage of clean clothes, plastic bags (in case of rain), medicines, matches, a harmonica, sleeping bags, water, rope, zip ties, a sketchbook, and a first-aid kit. Because he knew I’d be too busy fussing with the brisket to pack, he threw in my asthma medicine, my grandma’s candle sticks (which were likely packed in a similar fashion many years earlier, but not next to a bunch of zip ties) and a blank notebook. Then he was ready for the Seder. When it came time to compare backpacks, sacks, and pillowcases, it emerged that some of our guests found the exercise cleansing and others bracing. One family reported that as they contemplated what they might bring along they realized they didn’t have to bring much of anything; they had each other so wherever they went, they would be OK. The kids packed a lot of photos and stuffed animals. My kids even packed photos of their stuffed animals. There were a lot of musical instruments, including a ukulele, some baseball mitts, and some matches for which my younger son worried he’d get into trouble. (He’s also a worrier.) Not a lot of clean clothes. Books, toys, a pocketknife. My older son surprised us with a spontaneous recapitulation of the entire plot of Hana’s Suitcase, a book about a girl who died in the Holocaust and the story of the suitcase she left behind. Even though he found the whole enterprise depressing, he seemed to understand, in the end, what our suitcases signified. But another child observed that he liked the idea of starting fresh; that packing up and leaving everything behind in order to start again someplace new made him feel both powerful and free. I found myself feeling substantially the same way. I had my notebook. I had my grandma’s candle sticks. And my husband, who knows me very, very well, had packed a change of clothes and my asthma medicine. I had my kids, and they had their photos of their animals. It might just be the start of a great adventure. Often when we talk about surviving the Passover Seders, we are referring to enduring controlling parents, gluten allergies, and an endless service muttered in atonal half-speak-half-song. But this year it was about trying to replicate the actual fragile truth of Passover—that freedom and terror are close cousins and that we sit silently and uneasily next to them all year long.